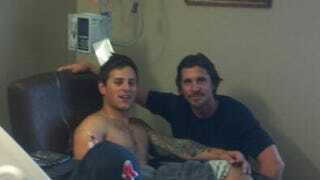 For days, a Facebook campaign has been asking Dark Knight Rises star Christian Bale to visit the Aurora shooting victims in the wake of last Friday's massacre ("I propose we should make enough noise asking Christian Bale to visit these kids in the hospital dressed in the real Batman outfit. They need to know Heroes can be real too, not just the bad guys," wrote poster Emily Sanchez). And today, he did. When Jason left his job at William Morris Endeavor in May 2011, it was under the impression that he was going to be managing Britney's career, but that hasn't happened. Now he feels like he is the househusband and errand boy in the relationship, and that isn't what he signed up for. Part of his role as co-conservator is to be with Britney every second that she is on the set of The X Factor, and he is getting fed up with it. He is constantly having to discipline her because of her erratic behavior on the show, which is creating major riffs in their relationship as well, because Britney doesn't like to be scolded or told what to do. The mixing of business with pleasure has really damaged their relationship, and they are both really unhappy at this point.